I can't find the book I want - what do I do now? We can order any English book for you (except out-of-print book titles. Please contact us and we will help you. Are all books listed on your website held in stock ready for despatch? We carry a wide range of book titles and the majority of books listed are held in stock ready for despatch after you place your order. However, our books stock in warehouse among different countries that will takes time to deliver. And some book titles have to be ordered in from the publisher before despatch. Our warehouses update the “DELIVERY TIME’' for each book title daily to make sure the time you see is accurate. Can I pre-order book which is “not yet published”? We offer many pre-order book titles on the site. Please bear in mind that the publication date listed on our site is the latest information we have from the publisher, and that this date may change. Where orders are placed for more than one item including some which are currently “In Print” and some which are “Not Yet Published”, we usually send the available books immediately. You will not be charged any additional postage for this service. In some circumstances we may feel it is better to wait until all items are ready for despatch, and in this case we will contact you for instructions. Most pre-orders will be dispatched on, or before publication date and we will make every effort to make sure they arrive with you as close to publication date as we can. You can browse pre-order book titles from the Coming Soon page. You don't need to log into the checkout to buy and you do have an option right at the end to save your details for next time - to save even more time on the few forms there are. You can still track your orders with your order number and last name without an account. If you have lost your password, go to the login screen and below the login boxes you'll see a link to Forgotten Password. Click on this link and you will be asked to enter the e-mail address attached to your account, once you've entered this you'll be sent a link – click on this to enter a new password. Please note that resetting your password in this way will result in any stored addresses and cards being deleted from your account. However it will not affect any of your existing orders. If you no longer have access to your e-mail address, you will have to set up a new account entirely. We fully abide by The Hong Kong Data Protection (Privacy) Ordinance. We'll never share, sell or otherwise leverage your data unless you agree to it. The information we collect is necessary for the smooth running of an e-commerce website - don't worry, we'll only ask for data that we need. Other countries: Please complete your shipping information in shopping cart first, and you will know the shipping charge before order confirm and submit payment. Please refer to the “DELIVERY TIME” stated in each book title. Our delivery times are based on the number of working days (Monday - Friday), you should expect to receive your delivery by. Delivery times may vary for each item even if they are ordered at the same time. If your order is overdue and your order tracking account does not state that the order has been dispatched, please contact us. How do you deliver the books to me? We ask for a contact number in case there are any urgent queries regarding your order. A number is also required by courier companies. Please provide as many phone numbers as possible to make sure our courier can contact you. Which countries do we deliver books to? We deliver books to popular countries worldwide. When you are checking out and entering your shipping information, you can see a drop down list of countries we deliver to. If your country isn't listed, please contact us. How to track my orders and check my order records? You will be provided an order number when order completed. You can track your order by checking your account information. You can still track your orders with your order number and email address without an account in our website. You can also check your order records at anytime if you have an account with us. You can register here. circumstances we may feel it is better to wait until all items are ready for despatch, and in this case we will contact you for instructions. 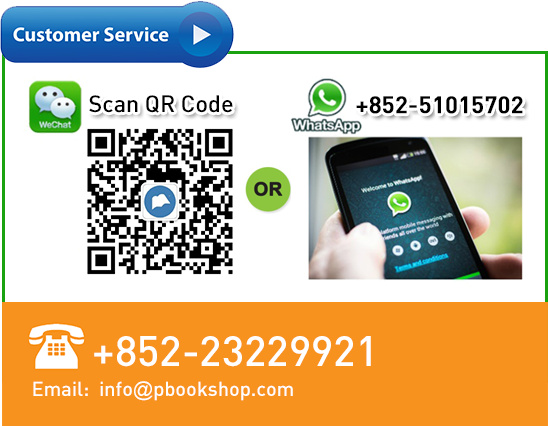 Our books are priced in HKD, RMB and USD. The default currency is HKD. You can change to other currencies on the top of the page. We only accept payment in HKD or RMB. Please choose your currency first before check out. However, if you choose USD, you will be charged in HKD at equivalent value because we do not accept USD payment. The USD currency is only for your easy reference. This is your card security number. For most credit cards, this number is 3 digits long and found on the signature strip on the back of your card. For American Express cards, this number is 4 digits long and found top right on the front of your card. We do not accept order cancellation after order confirmed by customers. *For customers outside Hong Kong, shipping surcharge will be imposed.